Recently on friend of mine asked me to help him install plugins to his Linux XBMC HTPC. I don’t have a big experience with that software (I use LinuxMCE on my HTPC). But I thought it shouldn’t be difficult. I was right. The plugin installation procedure is simple. But it needs some preparation steps which aren’t explained clearly and they are not in one place. So, have a look my brief how-to. To help unexperienced users perform that task easier I add a few scree-shots there. The VDPAU is packaged as standalone library. 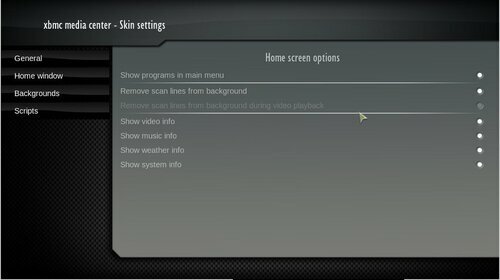 It’ll be still included into proprietary nVidia drivers to avoid additional installations. As I understand it’s done to provide some generic way for communications between OS and hardware for Linux. Something similar to DirectX. Good idea in my mind but I suspect that the other producers of video adapters will promote their solutions instead of using and improving of VDPAU. In any case, nVidia video cards is still the best option for Linux users. Especially with supporting of VDPAU which allows to play HD content even on Atom processor. Marmitek released its new EasyTouch Panel10 – wireless 10-inch color touchscreen panel. It can be used as X10 remote control, i. e. without controller or PC. 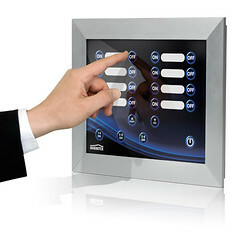 The interface of the EasyTouch Panel10 is completely customize. User can choose any background, buttons or images. Each button can be associated with desire action which should be performed when it’s pressed. The EasyTouch Panel10 uses two AAA batteries. So, it can be mounted anywhere in your house without additional wiring. The panel needs Transceiver Module TM13 to communicate with X10 devices. The EasyTouch Panel10 is available in Belgium at €199 and in UK at £179.00, which is reasonable price to add more comfort and hight-tech to your DIY X10 installation. All of you who like Star Trek and want to have LCARS – Library Computer Access/Retrieval System may be interesting to see demo video of new LinuxMCE theme below. It looks very nice in spite of it isn’t finished yet. Theme includes not just new wallpaper and color scheme. But new buttons, images and icons. So, after releasing it’ll be good option to add to your LinuxMCE box more style and fan. Let’s see the demo! You can see the progress of development of LinuxMCE Star Trek theme here. I already wrote about Seagate’s FreeAgent Theater – media player with dock for FreeAgent Go portable HDD. It looked very attractive. Especially for non-geek people who don’t want to spend their time to setup Popcorn Hour or HTPC. But it had one big disadvantage – missed HDMI output. It took 9 monthes to produce improved version of FreeAgent Theater. FreeAgent Theater+ has not only HDMI output but Ethernet port and ability to wireless connection to the LAN using USB WiFi adapter. Sure it supports all known media formats and containers as many networked media players as well as 1080p HD video, DTS 2.0 + Digital Out or Dolby Digital technology. The player for consumers offers a simple and intuitive user interface. The Seagate FreeAgent Theater+ is already available at $149.99. The bundle player plus 500Gb FreeAgent Go costs $289.99. The FreeAgent Theater+ Wireless Adapter is expected to be available in October as a separate accessory through Seagate.com for $69.99. Taking into account the price, offered functionality and the original idea for storage FreeAgent Theater+ can be success competitor for networked media players on the market. Another new product from Seagate is FreeAgent DockStar. It’s a dock-station for FreeAgent Go portable HDD with Pogoplug NAS capabilities. For the $99 you can get FreeAgent DockStar plus one year of Pogoplug remote access and sharing service ($29). Sure you may use original Pogoplug device to share HDD content in the local network. But FreeAgent DockStar is more suitable for FreeAgent Go owners. And it has two USB ports more.